Are you searching for a better place to purchase either traditional cigarettes or electronic cigarettes? Or, are you a patient searching for the right medical cannabis dispensary to assist you in achieving your health related goals? Welcome to the Smokedistrict Directory, an all-in-one resource for all things smoking. Whether you’re a traditional smoker, or looking for an alternative to cigarettes, Smokedistrict is your one-stop shop for everything from finding the right retailer, to learning what you need to know to get the most satisfying smoking experience. 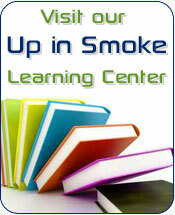 Up in Smoke Learning Center today. Are you a retailer specializing in traditional or electronic cigarettes, cigars or medical cannabis? Join our ever growing directory and portal to connect with literally thousands of smokers and patients…membership is only $15 per year. Our one of a kind, comprehensive portal provides needed exposure to both online and traditional retailers.